For most vintage guitar collectors and enthusiasts, 1965 stands as the single most important year in the history of Fender. It was in 1965 that management of Fender transferred to the CBS corporation who had purchased the company from Leo Fender for 13 million dollars (that’s two million more than they paid for the New York Yankees the year before). Fender guitars and basses from before 1965 are collectively referred to as Pre-CBS Fenders, and are considered far more desirable than anything Fender has built since. But what actually changed? How did the transfer of management really impact the instruments coming off the line in Fender’s Fullerton, California factory? Overall, the CBS-era changes can all be described as a shift to a more mass-production style of guitar making. Things began to change in late 1964 and the period from then until the beginning of 1966 is usually considered the “transition” period. Guitars from this era can be identified by their use of a serial number beginning with an L. The stretch from about 1966 until the early ‘80s is considered the true CBS-era and the low-point of Fender quality. Guitars and basses from late ‘65 to the mid-’70s, can be identified with a serial number that begins with an F.
From 1954 until 1959, most Fender guitars and basses used a pickguard made of a single piece of celluloid. Starting in 1959, most Fender pickguards consisted of three layers of celluloid with a top layer that added a certain greenish hue. In 1965, the switch was made from celluloid to ABS or vinyl; these guards are considered far less attractive by most collectors. 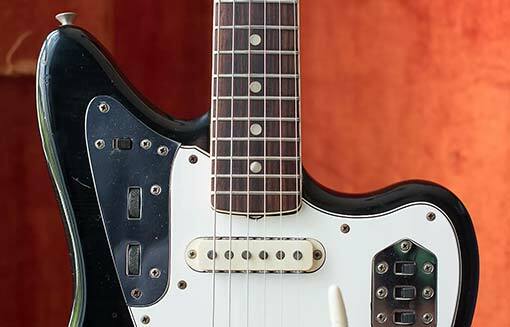 Browse vintage Fender pickguards. 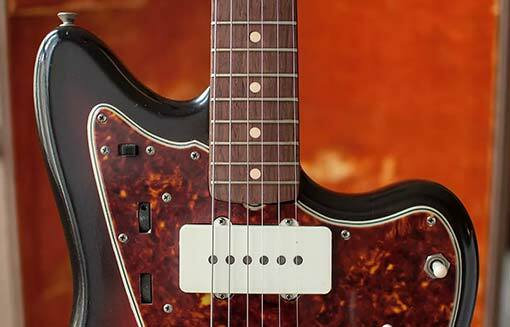 With the introduction of the Stratocaster in 1954, Fender set a precedent for sleek body contours that would carry through the Jazzmaster, Jazz Bass, Jaguar and beyond. The sports car-esque curves set Fenders apart from many other builders, but as CBS management took further control of production, the shape of most Fender designs becomes noticeably less curvaceous as another result of a more mass-production oriented production approach. By 1968, polyurethane replaced nitrocellulose as the primary finish used on Fender instruments. While some earlier Fenders had already used poly, as the CBS era wore on, it was made standard on more and more models. Polyurethane is thicker than nitro and has a generally heavier gloss. 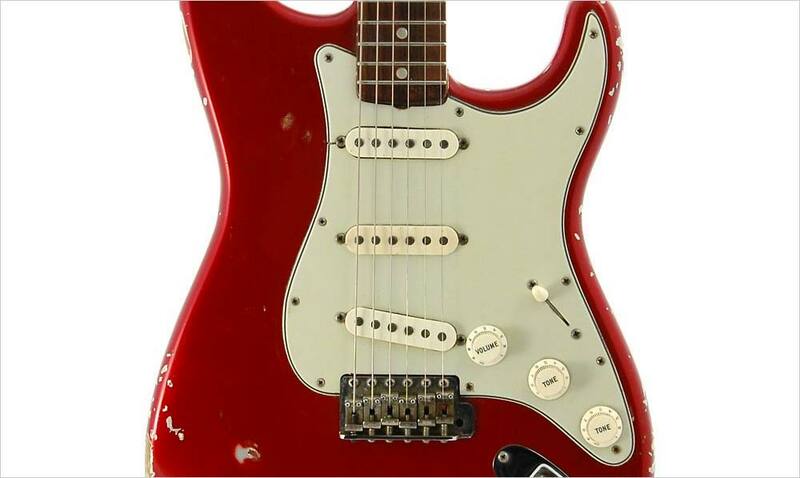 One of the early changes prompted by the CBS purchase of Fender was a switch in the material used for fingerboard inlays. Starting as early as late 1964, Fender fingerboards were inlayed with Pearloid dots where previously they had used clay. Changes implemented by CBS did not end with the ‘60s. A series of major design changes came in 1971 including a switch from a three bolt neck-plate replaced the earlier four bolt design. Also in 1971, Fender changed many of its bridges and saddles to cheaper, heavier designs, and introduced the ‘bullet’ truss rod system. All of these changes were implemented to reduce production costs. The changes brought about by the CBS purchase of Fender created a sharp divide in the history of the one of world's most iconic guitar makers. 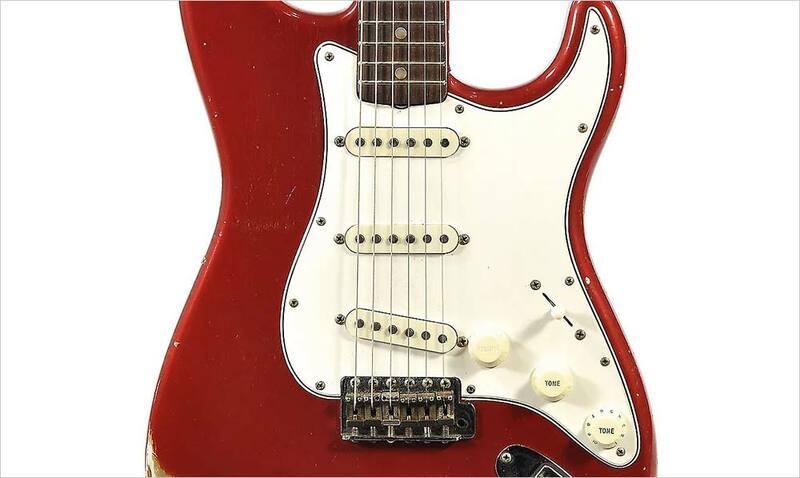 Post-1965 Fenders are automatically accepted as inferior instruments, and there are many collectors who simply will not consider purchasing anything made after the buyout. But that’s not to say that all post-CBS Fenders are of no interest to collectors. A number of new models were introduced during the CBS period that have since become absolute icons in their own right. The semi-hollowbody Thinline Telecaster, for example, didn’t launch until 1968. Also in this period, Fender launched a number of radical new models like the Coronado and Starcaster. CBS ownership lasted until 1985 when the company was sold to a group of Fender employes led by Bill Schultz.